At UKAA we produce a range of handmade bespoke tables. All are made by our team of skilled joiners here at our workshops in Cannock Wood, Staffordshire. 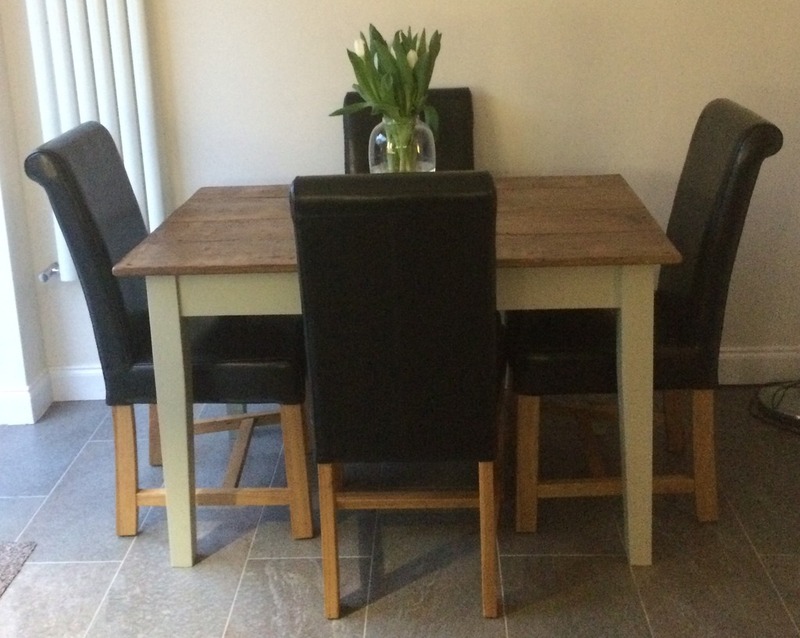 The tables are custom built to suit our customers specifications. They are available with a choice of tops which include plank topped, reclaimed pine and natural metal topped. The bases can be painted in the colour of your choice. At UKAA we are able to make bespoke handmade tables with reclaimed wooden tops that are made using old Victorian salvaged pine floorboards, these are all fantastic quality and made by hand on site here in Staffordshire by our team of skilled joiners. These rustic wooden tables are made by hand to suit your individual needs and requirements and can be designed for modern and traditional homes. The tables are ideal to use in residential or commercial environments such as pubs and restaurants. The table tops are made using our reclaimed Victorian floorboards that we currently have available. If you have a particular style or design table that you would like please contact us at the office. For more information or to order please do call us on 01543 222923. We have just received this lovely picture from one of our happy customers who has just taken delivery of her handmade floorboard top table. This bespoke table was made by hand here in our workshops in Staffordshire to our customer's bespoke size. The table top is made from antique reclaimed Victorian floorboards, which have been lightly sanded and waxed. We can make you a bespoke table like the table advertised please contact us at the office for more information. The team at UKAA have just commissioned this fantastic table top made using reclaimed vintage parquet flooring. 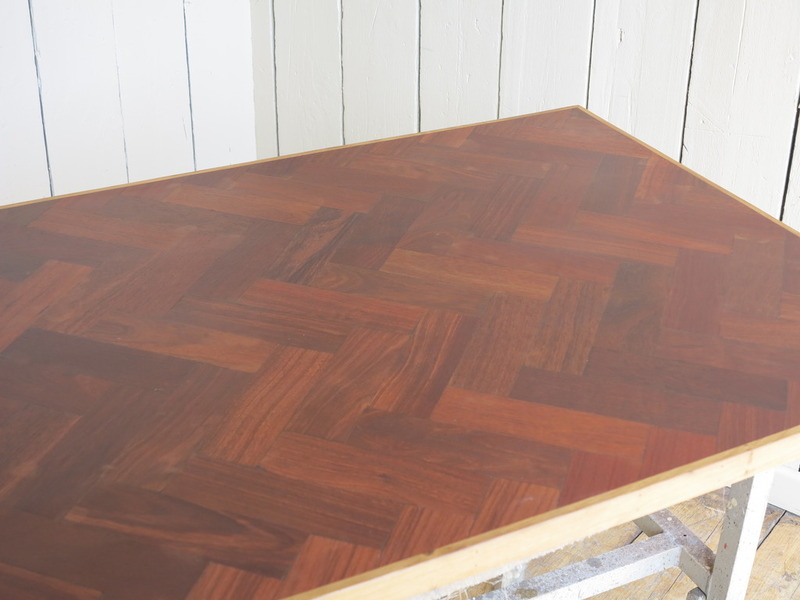 The wooden parquet used for the table top has been salvaged from a public building in Scotland and is circa 1920. We have used a traditional herringbone pattern in the parquet and this has been framed by a handmade wooden surround. This piece has been handmade bespoke so any size can be made, we can also make by hand wooden table bases to suit. For more information on any of our bespoke items please call the team on 01543 222923 or we are available on live chat during office hours. Tags : Table . Bespoke . Handmade . Parquet . Reclaimed Wooden Flooring . Salvaged . Custom Built. Here at UKAA we have just received this lovely image from one of our happy customers. We have recently made this lovely bespoke zinc table to our customer's specifications. This handmade solid natural zinc topped table has a turned base which has been painted in Farrow and Ball James White. For more information on any of our items we have for sale or to discuss your bespoke table please call the team on 01543 222923 and we can help. At UKAA we have recently finished a batch of pub/restaurant tables ready for sale. The tables were made by hand at UKAA using our team of onsite joiners. The table tops have been made using reclaimed Iroko wood, Iroko is a large hardwood tree from the west coast of Africa and is sometimes referred to as African Teak. The wood used for the table tops was originally laboratory tables in a school science class room. For more information on these tables please call the office on 01543 222923 or email info@ukaa.com. At UKAA we take great pride in our bespoke range of tables and kitchen works tops, we specialise in Zinc and Copper along with our reclaimed timer finishes. All our tables are made bespoke to suit our clients individual needs and requirements. With our zinc tables we only use natural copper and zinc, we use full thickness sheets and then the metal is wrapped over premium exterior grade MDF (We have specified this to reduce the movement due to temperatures changes that would be caused if the metal were to be combined with natural wood). For the table tops you can choose to have a natural bare metal, antique (Our Personal favourite) or distressed antique, the base can be painted in a colour of your choice or waxed in a range of shades. For more information on our bespoke zinc and copper tables please call the team on 01543 222923 or email info@ukaa.com. The team at UKAA have recently delivered this fantastic bespoke copper table to one of our customer in Scotland. This natural copper table has been made with a 40mm thick table top and has rounded corners. We have painted the base using RAL 3014 as requested by our customer. Our customer has sent the below image in to us and as you can see the table looks stunning especially with the vintage hand painted chairs. For more information on our bespoke table service please click here or please call the team 01543 222923 and we will be able to help. Tags : Bespoke . Copper . Natural . Made . UKAA . Table . Bespoke Table. UKAA are able to offer a bespoke table making service for Zinc, Copper, Floorboard topped and Plank topped tables. All of our tables are traditionally built by our highly skilled joiners here in our very own workshops. From pub and restaurant tables to 12 foot long banquet tables; we will make your table completely bespoke to your requirements. Included in the price of your table we can paint your base in any colour of your choice. Please see below some examples of our joiners previous work on some very vibrant tables!